FREE SHIPPINGThese Extender/Ceiling Guards are the perfect answer for lowering ceiling-hung playgyms, toys and other accessories down to eye-level. 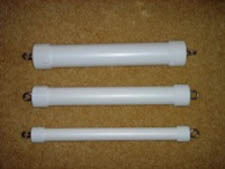 They are also designed to prevent your birds from climbing out of reach or for preventing them from damaging ceilings. SIZE: Medium - 1-1/2-inch diameter PVC x 18" long for Amazons, Greys, Smaller Macaws and Cockatoos and other similar-sized birds.